Food lovers are often inspired to try something new by staying connected to the food community. They may check out a hot new dessert spot because their friends are posting about it on IG. Others may have seen an Insider video promoting an amazing Korean bbq place down the street that they’ve been curious about. For those who don’t know where to look, Foodie Con, which took place on Saturday, April 7 to Sunday, April 8 2018 at THE REEF, is the perfect place to start. Local vendors congregated to showcase their best culinary creations at this event. As a veteran to the foodie scene, I was delighted to see familiar brands, such as Late July and Kite Hill. What excited my taste buds the most, however, was the opportunity to try local vendors unknown to me or sample new products yet to be released from companies I follow. Conveniently placed in front of the convention floor was Hippeas, snacks inspired by your favorite cheesy puff -but guess what- they’re good for you! Made of chickpeas, they’re vegan, gluten free, and super delicious. They pack the same crunch as cheetos but don’t bring all the guilt. You can grab a bag of these at a local Whole Foods or Starbucks. Although I have a sweet tooth, I’ve become picky about the treats I eat. I need them to be sweet, but not so sugar-infused that each bite is drilling a cavity. Fairytale Brownies meet all my requirements. Their simple formula literally wowed me. Offering bites of their walnut and cream cheese brownies, I was automatically hooked! Scrumptious, moist, and tantalizing, I ended up buying a box of all six flavors: chocolate chip, coconut, espresso nib, raspberry swirl, and of course, cream cheese and walnut. All of their products are only available online, but in the age of two day shipping you can enjoy these as soon as possible! This delicious jam and jelly company had a very cute display right in the middle of the exhibit floor. Decorated with crates, flowers, and everything rustic that brings the atmosphere for farm life, L.A. Farm girl supplied con-goers with plenty of samples. The one I had the pleasure of tasting was their honey habanero jelly. If you know me, I cannot handle spicy foods, yet this one packed a punch perfectly balanced by it’s sweetness. I can definitely see myself spreading a spoonful on a fresh biscuit or pairing it with my favorite nut butter for a sandwich. 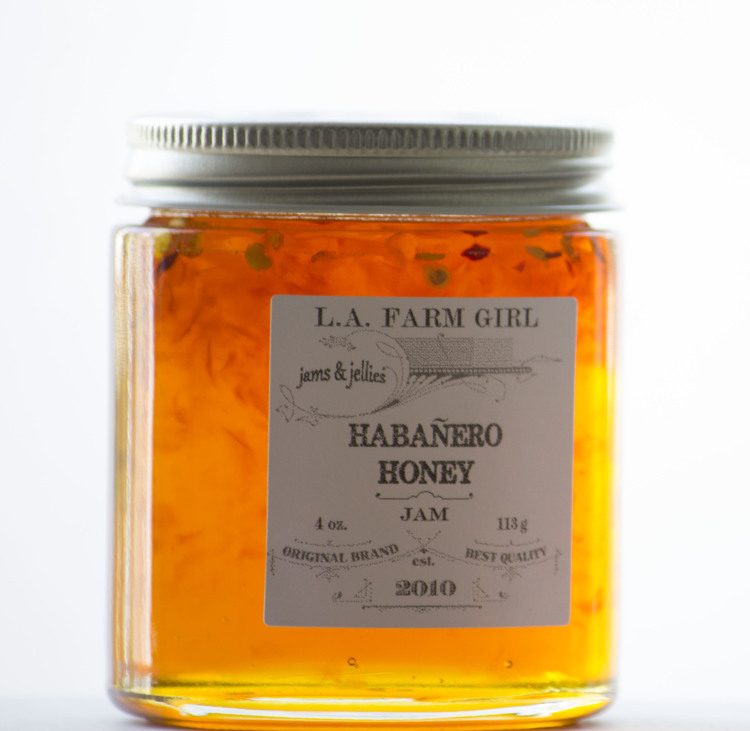 As of right now, you snag a jar by ordering online. Fortunately the website states that there will be locations coming soon in Venice, East L.A. and Hollywood. Speaking of nut butters, Eliot’s Nut Butter offered four samples, two spicy and two non-spicy. First I tried their espresso nib peanut butter and instantly realized I needed it in my life. With every bite I dreamed of creating an espresso peanut butter banana sandwich. Surprisingly, the garam masala peanut butter I tasted next out shown the first spread. I’ve never imagined Indian spices in a nut butter, but once I thought about the different spices and how they meld well with peanuts, I realized what I had been missing. The garam masala, with its complex blend of Indian spices melding perfectly with the mild sweet and saltiness of the peanut butter, is the missing link in the nut butter community. These evolved version of everyone’s favorite snack can be found San Diego or Santa Barbara, everyone else will have to bookmark their website. I first tried White Claw at a DIY music venue out in Atwater Village in the northeast corner of LA. Desperate for anything other than a PBR, I gave this hard seltzer a shot and I was definitely surprised. Not only is this drink refreshing, but it also goes down quite easily. It comes in a variety of flavors, including black cherry, raspberry, ruby grapefruit, and natural lime. Crafted from artesian waters through their signature Pure Brew process, this drink is super tasty and will satisfy your gluten-free friends. You can purchase a can at a mom and pop liquor shop, or surprisingly, at Target. Hailing from Portland, Oregon, Sake One surprised and buzzed me up with their pure and crisp sake made with waters from Oregon’s Willamette Valley. They brew their sake with partners from Japan. Their G sake was as smooth as silk, but packed a small bite that hits harder, though you won’t notice until your 4th shot. That’s a true testament to the sweetness of G and how easily it goes down. I also tried the Momokawa sake which was laden with apple, pear, and melon flavors that will lift up any soul. Sake One can be found on their website, as well as local retailers, such as BevMo and Erewhon. This LA brewery decided to feature their new seasonal fruit beer, SaazBerry. Yep - you guessed it - the saazberries DO taste like saazberries! But what is a saazberry beer? Well it’s made with saaz hops, raspberry, blueberry, and elderberry. Brewed into a classic American ale, it’s fruity, hoppy, earthy, and tangy all at the same time. Have this perfect summer drink on the brewery’s deck in Downtown LA. Lagunitas Brewery decide to show off their new IPA, A Little Sumpin’ Sumpin. This silky-smooth wheaty brew has the classic Lagunitas IPA flavor but is also blended out just enough to make a Hefeweizen fan take a second - and third sip. Drink one on their gigantic patio and pair it with a meal from their full kitchen, as their new taproom in Azusa will be open and ready to satisfy your chill summer vibes. Foodie Con didn’t disappoint with its variety, continuing to be the perfect playground for discovering new and local yumminess. All in all, they chose many wonderful vendors who made me an eager fan to seek them out at local supermarkets and shops.